With so many channels and platforms to choose from these days there's never been more television viewing to choose from. 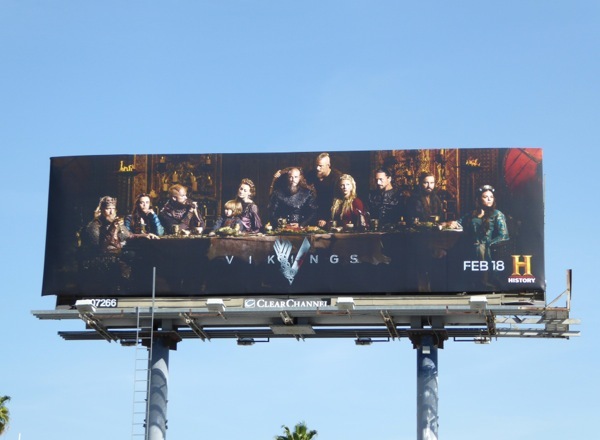 However even with all this choice when it comes to marketing these TV shows, there's several ideas which keep popping up when it comes to season promo billboards. 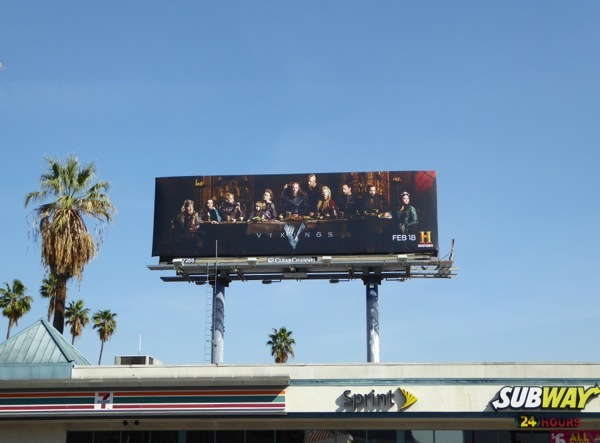 Case in point is the season four billboard for History's Vikings series, which seems to be channeling Leonardo da Vinci's iconic painting of The Last Supper. 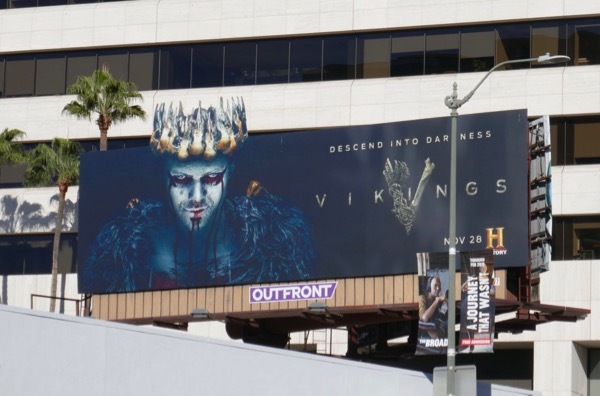 This rather dark, brooding ad creative for the fourth season featuring Travis Fimmel's Viking leader 'Ragnar Lothbrok', and those vying for his powerful seat, was photographed along Sunset Boulevard at La Brea Avenue on February 12, 2016. 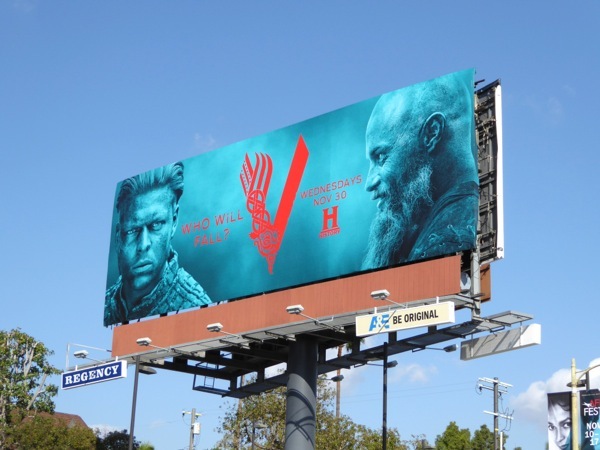 If you're a fan of the gritty historically accurate scripted drama, be sure to check out these previous season billboards for Vikings. 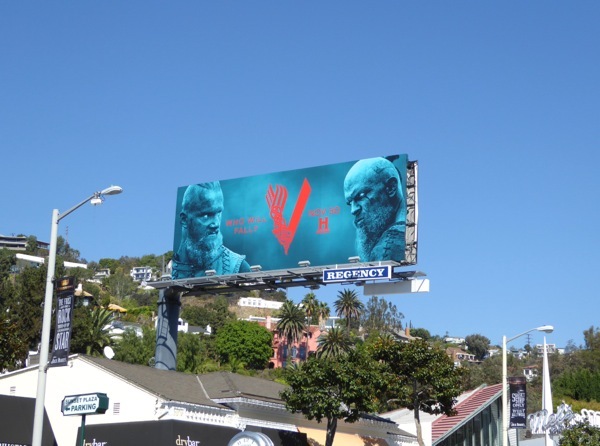 For similar designs inspired by The Last Supper, you should also take a look at this Black Jesus season two billboard from last October and this movie billboard for The Expendables 2 from 2012. 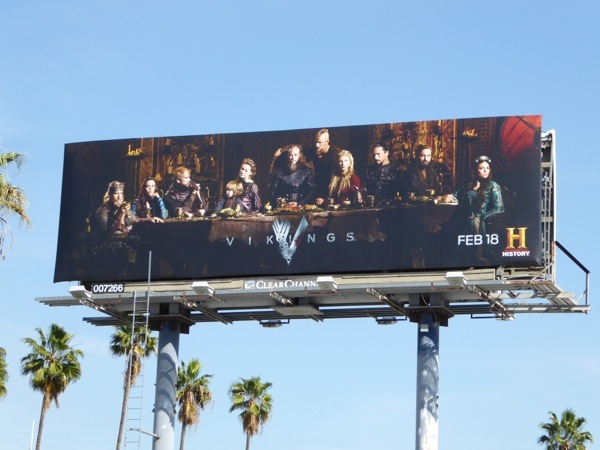 Now get ready for more passion and pillaging, Vikings style. 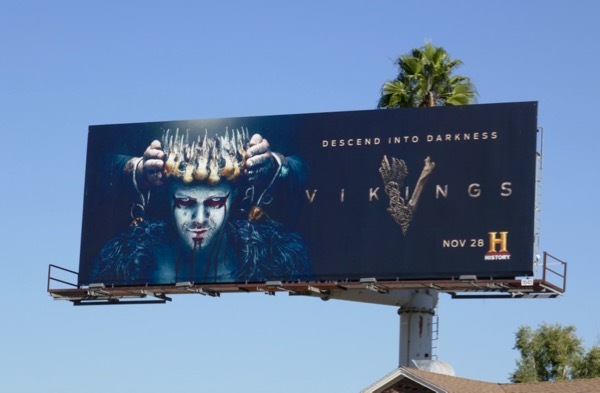 UPDATED: The fourth season of History's Vikings consisted of twenty episodes and was split into two batches of ten episodes. 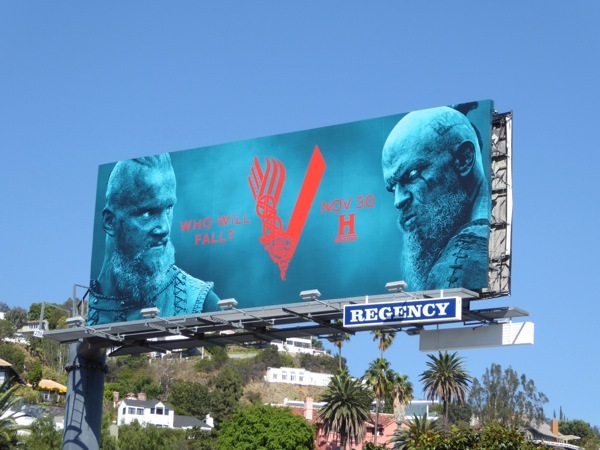 Now the historical drama is back with a vengeance for the second part of season four with this striking billboard pitting Ragnar's son 'Björn Ironside' (Alexander Ludwig) against 'Floki' (Gustaf Skarsgaård), but who will fall? 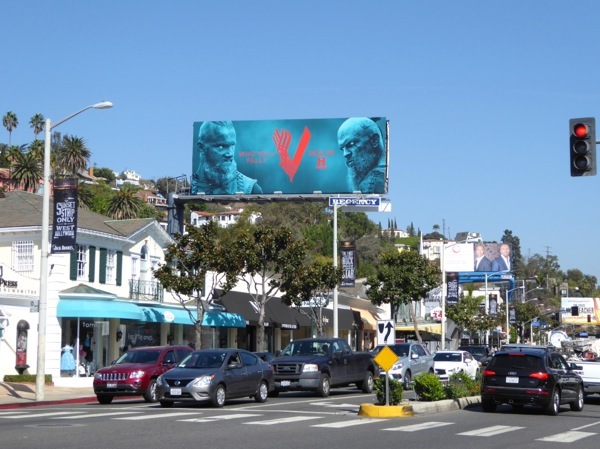 The blue and red colour scheme of this midseason ad creative, snapped along West Hollywood's Sunset Strip on October 25, 2016, reminds Daily Billboard of the recent season three billboards for The Strain. 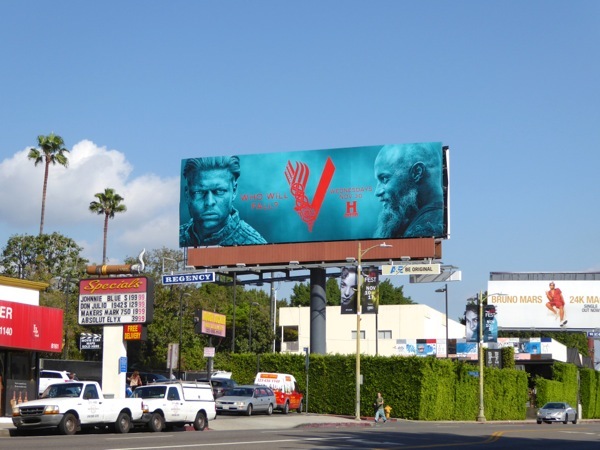 UPDATED: Here's another of the dramatic season four second half billboards, featuring his crippled son 'Ivan the Boneless' (Alex Høgh Andersen) and Ragnar, snapped further east along Sunset Boulevard on November 1, 2016. 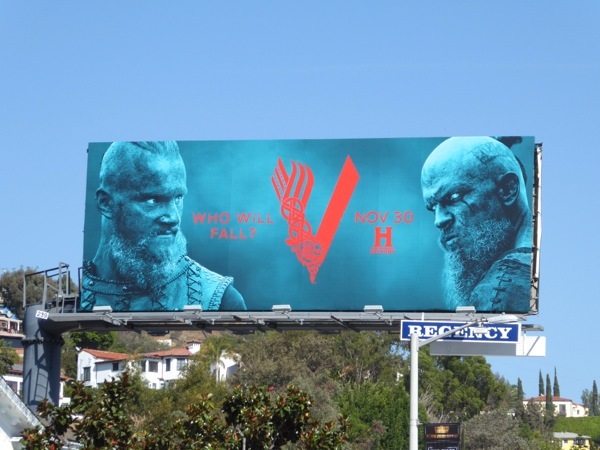 UPDATED: Here's also the foreboding season five part two promo billboard for Vikings photographed above the intersection of San Vicente and Wilshire Boulevards on November 13, 2018. 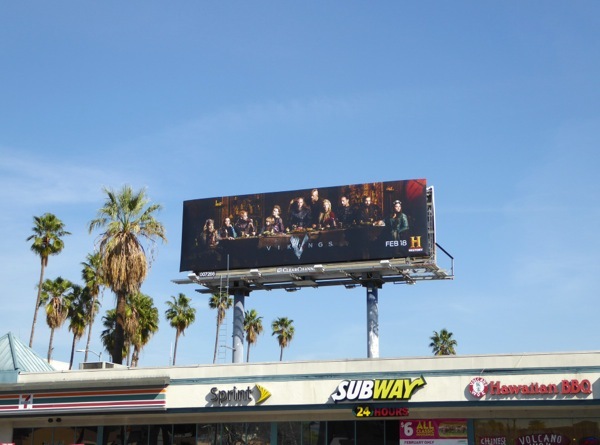 Plus here's a fantastic special extension crown cut-out version for the midseason return spotted along Santa Monica Boulevard beside the 405 Freeway on November 26, 2018.